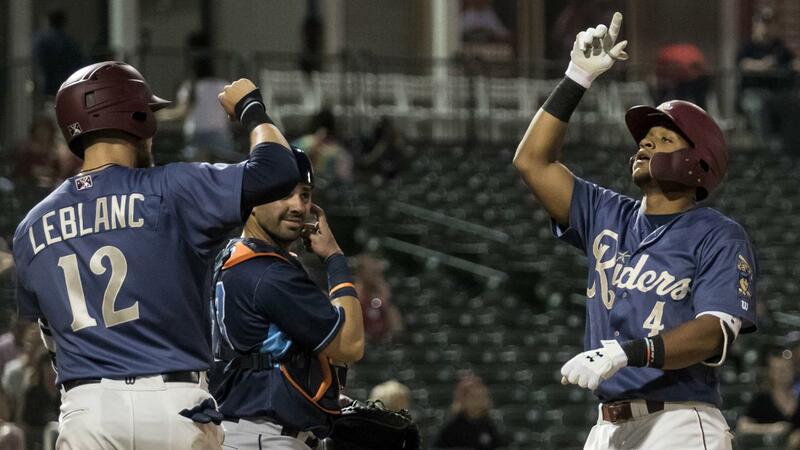 FRISCO, Texas (April 9, 2019) - Fueled by two home runs and a career-best seven RBIs from Andretty Cordero , the RoughRiders cruised to an 11-3 win over the Corpus Christi Hooks Tuesday night at Dr Pepper Ballpark. * After bringing home a run with a groundout in the second, Cordero hit a pair of three-run homers in the fourth and fifth innings. His second roundtripper was part of a six-run fifth inning. * Eliezer Alvarez also hit a pair of homers, providing the final two runs in a string of 12 unanswered tallies between the second and eighth innings. * Starter Pedro Payano emerged victorious on the mound, allowing one hit and no runs in his final three innings after allowing three runs in the first two frames. * Cordero's seven RBIs fell one shy of the franchise's single-game record. * Frisco has combined for 23 runs the last two games after scoring just nine times in the season's first four contests. * The Riders have held opponents to four runs or fewer in all six games so far. The Frisco RoughRiders are the Double-A affiliate of the Texas Rangers and play their games at beautiful Dr Pepper Ballpark in Frisco, Texas. The team was founded in 2003 and has finished first among all Double-A franchises in attendance in each of the last 14 seasons (2005-2018). In August 2014, the RoughRiders were purchased by an ownership group led by Chuck Greenberg. Since then, the new ownership group, together with the City of Frisco, has spearheaded numerous major franchise enhancements, investing over $8 million in a wide array of facility upgrades and improvements, including a state-of-the-art HD video board, sound system, Bull Moose Saloon, InTouch Grille, Riders Outpost Team Store and the world's largest water feature in a sports facility, the massive Choctaw Lazy River. These enhancements earned the Riders and the City of Frisco Ballpark Digest's prestigious "Best Ballpark Renovation" award for xtwo consecutive years (2015 and 2016). 150 former RoughRiders players have gone on to play Major League Baseball, including All-Stars Chris Davis, Adrian Gonzalez, Ian Kinsler and Neftali Feliz, as well as current Rangers stars Elvis Andrus, Joey Gallo, Isiah Kiner-Falefa and Rougned Odor. For more information on the Frisco RoughRiders and Dr Pepper Ballpark, please visit RidersBaseball.com or contact Ryan Rouillard at RRouillard@RidersBaseball.com.